Back to "Poppy Parker 12.5 & 16""
Poppy Parker Fashion Teen The Glad Game 16"
July 2013 Collection. LE300. Poppy is as cheerful as Pollyanna on this beautiful spring day! 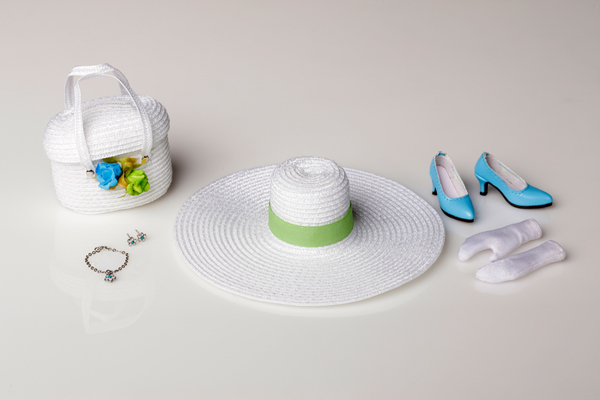 Our favorite fashion teen wears a green, white and blue dress with a wide-brimmed white straw hat and a coordinating white straw bag adorned with blue and green flowers. Her look is complete with white gloves and blue pumps. This is a 16-inch articulated vinyl doll with fully rooted, dewdrop blonde hair and hand applied eyelashes. A doll stand is included. For adult collectors 14 years and up.